Gold has been sought after for over 6,000 years. It has been used throughout history as currency, jewelry and in industrial applications. Although it is one of the oldest forms of money, gold continues to be used and traded today as an asset of real value. 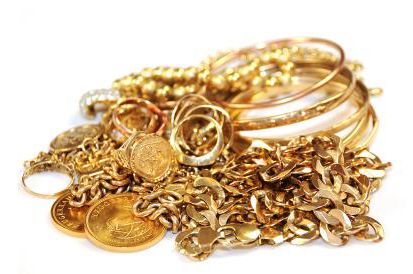 At Hat City Pawn, we buy gold jewelry, coins and bullion. We pride ourselves on offering our customers competitive prices on their gold. We strive to offer the best prices in town. In fact, Hat City Pawn’s prices will not be beat by another pawn shop or gold buyer. Gold is one of the best, if not the very best asset for you to use for collateral pawn loans. Gold trades for around $1,600 per troy ounce, so customers can easily sell their gold or get pawn loans for the money they need with even a small amount of gold. We perform a nondestructive acid test on all of the gold we buy in order to accurately measure the purity of your precious metals. The purity goes by 10K, 14K, 18K, etc.. We then weigh the individual gold item(s) and provide you with an offer based on their weight and purity. At Hat City Pawn, our guarantee is to pay the highest price for gold. If you’re interested in learning more about how we go about buying gold, or have other items to offer us, please stop in and see us. We are always interested in buying anything of value or anything we think we’ll be able to sell.